Smith-Schuster is slated to become the Steelers' unquestioned No. 1 wide receiver following the trade of Antonio Brown to the Raiders, Kevin Gorman of the Pittsburgh Tribune-Review reports. Smith-Schuster (knee) isn't believed to be dealing with a serious injury, Jeremy Fowler of ESPN.com reports. Smith-Schuster limped to the bus and declined comment after suffering a knee injury during the Pro Bowl on Sunday, The Associated Press reports. Smith-Schuster sustained a knee bruise during the Pro Bowl on Sunday, Brooke Pryor of The Kansas City Star reports. Analysis: Smith-Schuster caught one of three targets for 16 yards prior to leaving the game. The injury doesn't appear overly serious, but it would nevertheless be surprising to see the 22-year-old retake the field Sunday. Smith-Schuster caught five of 10 targets for 37 yards and a touchdown during Sunday's 16-13 win over Cincinnati. Smith-Schuster hauled in 11 of 15 targets, amassing 115 receiving yards during Sunday's 31-28 loss to the Saints. Smith-Schuster (groin) is listed as active for Sunday's game against the Saints. Analysis: Smith-Schuster headed into the weekend listed as questionable after not practicing Friday, but the wideout subsequently tweeted out assurances that he would play Sunday. With that outcome now official, Smith-Schuster figures to remain a focal point in the Pittsburgh passing game, assuming no in-game setbacks. Smith-Schuster (groin), who is listed as questionable for Sunday's game against the Saints, posted on his personal Twitter account Saturday that he intends to suit up this weekend. Smith-Schuster (groin) is listed as questionable for Sunday's game against the Saints. Analysis: Given that Smith-Schuster left Thursday's practice early and sat out the entire session Friday, the wideout's Week 16 status is truly up in the air. Hopefully, added clarity regarding his availability will arrive prior to the early wave of games Sunday, especially with the Steelers and Saints not kicking off until 4:25 p.m. EST. If Smith-Schuster is unable to go, James Washington would be called upon to start in his place, per Ray Fittipaldo of the Pittsburgh Post-Gazette. Smith-Schuster (groin) wasn't in uniform and didn't participate in the portion of Friday's practice that was open to the media, Peter Diana of the Pittsburgh Post-Gazette reports. Smith-Schuster was a limited participant in Thursday's practice after exiting early with a groin injury, Ray Fittipaldo of the Pittsburgh Post-Gazette reports. Analysis: The Steelers haven't commented on the severity of Smith-Schuster's setback, but the timing is far from ideal for both Pittsburgh and the wideout's fantasy managers alike. Smith-Schuster declined to shed light on his injury when he met with the media after Thursday's session, making his status uncertain for Sunday's game in New Orleans. If Smith-Schuster ends up sitting out, James Washington would be the leading candidate to enter the starting receiver ranks. Smith-Schuster brought in four of 10 targets for 40 yards in the Steelers' 17-10 win over the Patriots on Sunday. Smith-Schuster brought in eight of 12 targets for 130 yards and two touchdowns in the Steelers' 24-21 loss to the Raiders on Sunday. Smith-Schuster caught six of nine targets for 49 yards during Sunday's 33-30 loss to the Chargers. Analysis: This was a disappointing effort for Smith-Schuster, who managed just 8.2 yards per catch -- well below the 13.7 YPC he brought in to the game. It also snapped his streak of four straight games with at least 70 yards or a touchdown. He'll look to return to form against Oakland -- which allows the second-most points per game (30.6) in the league -- in Week 14. Smith-Schuster corralled 13 of a team-high 17 targets, amassing 189 receiving yards and one touchdown during Sunday's 24-17 loss to the Broncos. Smith-Schuster caught eight of the 10 balls thrown his way for 104 yards in Sunday's 20-16 win over Jacksonville. Analysis: Owners who stuck with Smith-Schuster in this tricky matchup were rewarded, as he played a major role in Pittsburgh's late comeback from a 16-0 deficit, even though he didn't do any of the scoring himself. This was the second-year wide receiver's fifth game with over 100 receiving yards this season. The Broncos will have a hard time trying to cover both JuJu and Antonio Brown on the outside in Week 12. Smith-Schuster corralled three of five targets for 90 yards and a touchdown and added one rush for 13 yards in the Steelers' 52-21 win over the Panthers on Thursday. Smith-Schuster caught seven of nine targets for a team-high 78 receiving yards in Sunday's 23-16 win over Baltimore. Analysis: Smith-Schuster was taken off to the concussion tent after a nullified 23-yard catch in the third quarter, but he was able to promptly return later in the same drive. While the second-year stud is a tremendous player in his own right, he's clearly Pittsburgh's third-most dangerous weapon behind Antonio Brown and James Conner, both of whom scored receiving touchdowns in this one. Smith-Schuster will be right back in action Thursday against the Panthers in Week 10. Smith-Schuster caught four of his six targets for 33 yards during Sunday's 33-18 win over Cleveland. Analysis: Smith-Schuster was a victim of game flow, as the Steelers relied heavily on the running game to nurse a large lead and he saw just one target after halftime. That resulted in his lowest yardage total this season, but it shouldn't deter fantasy owners from using him moving forward, even against a strong Baltimore defense in Week 9. Smith-Schuster caught seven of 10 targets for 111 yards and converted a two-point conversion in Sunday's 28-21 win over the Bengals. Analysis: Smith-Schuster made a brilliant catch with the game tied 7-7 in the second quarter, turning what should have been an interception into a 29-yard gain down to the one-yard line. He led the Steelers in targets and receiving yards while tying tight end Vance McDonald for the team lead in catches. Antonio Brown scored the team's lone touchdown, however. Smith-Schuster and the rest of the Steelers will be on bye in Week 7. Smith-Schuster brought in all four of his targets for 34 yards and a touchdown in the Steelers' 41-17 win over the Falcons on Sunday. Smith-Schuster caught four of 11 targets for 60 yards during Sunday's 26-14 loss to the Ravens. Smith-Schuster (abdomen) does not carry an injury designation for Sunday night's game against the Ravens. Analysis: Smith-Schuster is easy to push play on Week 4, considering that through the first three weeks of the season, he leads the Steelers with 27 catches (on 38 targets) for 356 yards (good for fifth in the NFL) and a TD. Smith-Schuster (abdomen) returned to a limited practice Thursday, the Pittsburgh Tribune-Review reports. Smith-Schuster didn't practice Wednesday due to an abdominal injury. Analysis: Smith-Schuster and Mike Hilton (elbow) were the only two Steelers who missed practice due to injuries, so the wideout's status will be worth tracking as Sunday's game against the Ravens approaches. In the Steelers' Week 3 win over the Buccaneers, Smith-Schuster was on the field for 55 of a possible 66 offensive snaps, hauling in nine of his team-high 11 targets for 116 yards. Smith-Schuster totaled 116 yards on nine catches in Monday's 30-27 win over the Buccaneers. Analysis: Smith-Schuster led the team with 11 targets and, for the fourth straight game dating back to last season, eclipsed the 100-yard mark. He now has 27 catches for 356 yards and a touchdown, and with defenses having to focus on Antonio Brown, Smith-Schuster should continue to put up big numbers in Pittsburgh's potent offense. Smith-Schuster snagged 13 of 19 targets for 121 yards and a touchdown during Sunday's 42-37 loss to Kansas City. Analysis: Smith-Schuster toe-tapped for a two-yard score midway through the second quarter, the team's second of three in the quarter. After being a deep threat in the season opener, Smith-Schuster found more success underneath Week 2. Meanwhile, the sophomore receiver has as many catches and two more 100-yard games than Antonio Brown through the season's first two weeks. Buy what Smith-Schuster is selling. Smith-Schuster caught five of eight targets for 119 yards during Sunday's 21-all draw with the Browns. Analysis: Smith-Schuster finished second on the team in targets and led the way in receiving yards, thanks in large part to a 67-yard gain which set up a touchdown in the third quarter. He didn't factor in during the rest of regulation or overtime, but it was still a productive season debut for the second-year pro. Smith-Schuster is set for a large role in the offense this season and will look to build on his excellent start next week against the Chiefs. Smith-Schuster caught six of eight targets for 46 yards during Saturday's preseason game against the Titans. Analysis: Smith-Schuster seemed to be the focal point of the passing game on a day the Steelers offense was without both Le'Veon Bell and Antonio Brown. While the youngster's encouraging day was dampened a bit by two drops he had, Smith-Schuster nonetheless looks like even more of a threat than he was his rookie season, which is an encouraging development for those with fantasy investments in the up-and-coming 21-year-old. Smith-Schuster brought in his only target for a four-yard touchdown in the Steelers' 51-34 preseason loss to the Packers on Thursday. Smith-Schuster (knee) has resumed practicing, Jeremy Fowler of ESPN.com reports. Analysis: Smith-Schuster didn't practice Monday, but his subsequent return to the field sets the stage for the wideout to be available for Thursday's preseason game against the Packers. That said, with the Steelers inclined to rest key cogs on offense such as Ben Roethlisberger and Antonio Brown, it's unclear how much action, if any, Smith-Schuster might see in the team's second exhibition game. Smith-Schuster isn't practicing Monday, Dale Lolley of DKPittsburghSports.com reports. Analysis: The second-year wideout has been bothered by a sore knee on-and-off dating back to at least June minicamp, but it didn't stop him from scoring a 71-yard touchdown in last week's preseason win over the Eagles. With no report of a setback or a new injury, the Steelers likely are just trying to keep Smith-Schuster fresh ahead of Thursday's exhibition in Green Bay. His availability for the game will come into serious question if he's also held out of practice Tuesday. Smith-Schuster (knee) caught his lone target for a 71-yard touchdown in Thursday's 31-14 preseason win over the Eagles. Analysis: Smith-Schuster took advantage of a free play when the Eagles went offside, beating CB Rasul Douglas for a jump ball and outracing safety Tre Sullivan to the end zone. The second-year wideout seems to have made a full recovery from the minor knee injury that held him out of Sunday's practice. Smith-Schuster is not participating in Sunday's practice after being seen icing his left knee following Saturday's training camp session, Jeremy Fowler of ESPN.com reports. Analysis: Smith-Schuster appears to simply be dealing with minor knee soreness, but the Steelers will proceed cautiously with the health of their No. 2 wide receiver with veteran Antonio Brown (undisclosed) also currently sidelined. Smith-Schuster's absence from practice figures to afford James Washington, Justin Hunter and Darrius Heyward-Bey additional reps with the first-team offense. Smith-Schuster (undisclosed) participated in Thursday's practice, Chase Williams of WPXI reports. Smith-Schuster is tending to a minor undisclosed injury, Jeremy Fowler of ESPN.com reports. Analysis: Lending credence to the notion that Smith-Schuster's issue is minor is that the wideout was spotted catching passes after his early exit from practice Sunday, per Ray Fittipaldo of the Pittsburgh Post-Gazette, and looked fine in doing so. As a result, consider Smith-Schuster day-to-day. Smith-Schuster (knee) is practicing Friday, Jeremy Fowler of ESPN.com reports. Analysis: Limited to individual work during June minicamp, Smith-Schuster seems to be back at full strength for the start of training camp. He's locked in as the No. 2 wide receiver in a high-powered offense, following a rookie season in which he produced 65.5 yards per game and 11.5 yards per target. With Martavis Bryant off to Oakland, the second-year wideout should push for triple-digit targets. Smith-Schuster will participate only in individual drills during minicamp due to a left knee issue but said he will be healthy for the start of training camp, Jeremy Fowler of ESPN.com reports. 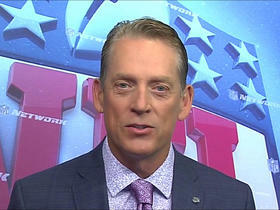 Smith-Schuster told Yahoo's Tank Williams that the departure of Martavis Bryant will give the second-year wideout a better opportunity to show what he's capable of. Smith-Schuster had nine receptions (on 10 targets) for 143 yards and a touchdown, and added a 96-yard kickoff return for another score, in Sunday's 28-24 win over the Browns. He finished the 2017 season with 58 catches (on 80 targets) for 917 yards and seven touchdowns, and added 240 yards and the touchdown on nine kick returns in 14 games. Analysis: Smith-Schuster was clearly Landry Jones' favorite receiver, and the rookie took advantage of the opportunity and the absence of Antonio Brown (lower leg). The first Steelers player with a receiving touchdown and a kick return touchdown in the same game since Gary Ballman in 1963, Smith-Schuster gives the team another weapon in an already potent arsenal. Smith-Schuster led his team with six catches for 75 yards and a touchdown on seven targets in Monday's 34-6 win over the Texans. Analysis: Smith-Schuster was quiet for most of this one, but came up with a 49-yard grab and an 18-yard touchdown on one drive in the fourth quarter to make fantasy owners happy. He and Martavis Bryant should continue to see added attention from quarterback Ben Roethlisberger while Antonio Brown (calf) heals. With Pittsburgh needing a win and a New England loss next week to secure home-field advantage in the AFC playoffs, expect big things from Smith-Schuster against the hapless Browns. Smith-Schuster will take on an expanded role over the final two weeks of the regular season with Antonio Brown (calf) out of the lineup, ESPN.com's Jeremy Fowler reports. Smith-Schuster (hamstring) brought in all six of his targets for 114 yards in Sunday's 27-24 loss to the Patriots. He also returned two kickoffs for 49 yards. Smith-Schuster (hamstring) is listed as active for Sunday's game against the Patriots. Analysis: Smith-Schuster thus returns to action following a one-game suspension, and with New England likely to focus on containing star wideout Antonio Brown on Sunday, Smith-Schuster could be a sneaky Week 15 fantasy play, assuming no setbacks with the hamstring issue that limited his practice participation Thursday and Friday. Smith-Schuster (hamstring), who logged a limited practice Friday and is listed as questionable, is expected to play Sunday against the Patriots, Adam Schefter of ESPN reports. Analysis: Smith-Schuster missed last week's game due to suspension for an illegal hit, but now the Steelers should have all of their weapons back on the field. While his absence didn't ultimately cost the Steelers in Sunday night's high-scoring win against the Ravens, it typically takes all hands on deck to beat the Patriots. Smith-Schuster could find himself in single coverage quite often if Bill Belichick does his thing and tries to shut down the opponent's best player, that being Antonio Brown. Smith-Schuster (hamstring) is listed as questionable for Sunday's game against the Patriots after logging a limited practice Friday. Analysis: Smith-Schuster is eligible to return to action following a one-game suspension, but after being added to the Steelers' injury report Thursday, his Week 15 status should be monitored as Sunday's 4:25 ET kickoff approaches. Smith-Schuster could make some noise if he is able to play without limitation this weekend, with the Patriots likely to focus on containing star wideout Antonio Brown. Smith-Schuster (hamstring) was limited at practice Thursday. Analysis: Smith-Schuster, who is back from a one-game suspension, was added to the Steelers' injury report Thursday, so his status for Sunday's game against the Patriots is worth monitoring. With New England likely to focus on containing star wideout Antonio Brown on Sunday, Smith-Schuster could be a sneaky fantasy play this week, that is, of course, if his hamstring issue doesn't impact his effectiveness or availability this weekend. Smith-Schuster's suspension was lifted Monday, according to the league's official transaction log. Analysis: Smith-Schuster has officially satisfied the one-game suspension he received for his hard hit on Bengals linebacker Vontaze Burfict in Week 13. The rookie can now look forward to a highly anticipated matchup with the Patriots on Sunday. The NFL has upheld Smith-Schuster's one-game suspension, Adam Schefter of ESPN reports. Analysis: Smith-Schuster will miss Sunday's game against the Ravens and is eligible to return the following week in a matchup against the Patriots. In his absence, Antonio Brown (toe) should continue to lead the Steelers' receiving corps, while Martavis Bryant and Eli Rogers will presumably absorb a share of the rookie's usual target allotment. Smith-Schuster has been suspended for one game for a violation of the NFL's safety-related playing rules, Ian Rapoport of NFL Network reports. Analysis: Smith-Schuster's suspension follows the hit that the wideout delivered on Vontaze Burfict during Monday's win over the Bengals. With Smith-Schuster now set to miss Sunday's contest against the Ravens, Antonio Brown (toe) will continue to head to Steelers' wideout corps in Week 14, while Martavis Bryant and Eli Rogers are candidates to absorb a share of the rookie pass catcher's normal target allotment. The NFL is reportedly considering a one-game suspension for Smith-Schuster, stemming from the hit the wideout delivered on Vontaze Burfict during Monday's win over Cincinnati, Mike Garafolo of NFL Network reports. Analysis: Smith-Schuster was on the field for 82 percent of the Steelers' snaps on offense in Monday's 23-20 win over the Bengals, en route to catching four of his five targets for 17 yards. If he's sidelined Sunday against the Ravens, Antonio Brown (toe) would of course continue to head to Steelers' wideout corps, with Martavis Bryant and Eli Rogers candidates to absorb a share of Smith-Schuster's typical target allotment. 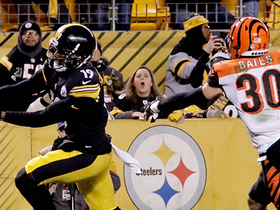 Smith-Schuster caught 4-of-5 targets, but managed just 17 yards in Pittsburgh's 23-20 win over Cincinnati on Monday. Analysis: The rookie struggled to get free all game, and was held to seven yards or less on each of his receptions. 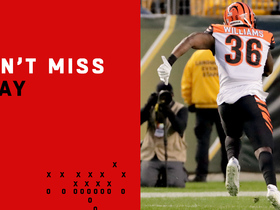 The frustration eventually got to him, as Smith-Schuster was called for two personal fouls after an illegal hit on Vontaze Burfict late in the fourth quarter. Smith-Schuster will likely be fined, and could even be hit with a suspension, that would force him to miss Pittsburgh's Week 14 contest against division rival Baltimore. Smith-Schuster (hamstring) practiced fully Thursday. Analysis: Smith-Schuster's full practice participation Thursday signals that he should be fine for Monday night's game against the Bengals, assuming no setbacks as the practice week continues. Prior to missing this past Sunday's game against the Packers, the rookie wideout had hauled in 33 catches for 568 yards through 10 games, to go along with five TDs, three of which were scored over his last four outings. Head coach Mike Tomlin said Tuesday that Smith-Schuster (hamstring) "definitely will have a chance" to play Sunday in Cincinnati, Joe Rutter of TribLive.com reports. Analysis: Emerging from a Week 11 win against the Titans with a minor hamstring injury, Smith-Schuster didn't practice last week and was eventually ruled out for Sunday's game versus the Packers. The narrative surrounding his health would change with an appearance at practice Wednesday, but it remains to be seen the capacity in which he'd be able to do so. 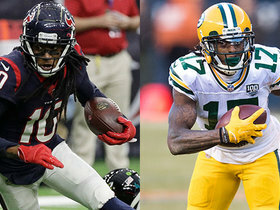 Smith-Schuster (hamstring) has been ruled out for Sunday's game against the Packers, Adam Schefter of ESPN reports. Analysis: By all accounts, Smith-Schuster is dealing with a "small" hamstring injury, but he's been unable to practice since the Steelers last took the field Nov. 16 against the Titans. With his absence confirmed this weekend, the door has been opened for Martavis Bryant and, to a lesser extent, Eli Rogers to make an impact. Smith-Schuster (hamstring) didn't practice Thursday. Analysis: Back-to-back missed practice sessions make Smith-Schuster's Friday participation (or lack thereof) key with regard to his chances of suiting up Sunday night against the Packers. If Smith-Schuster ends up out this weekend, or limited all, Martavis Bryant could see an uptick in snaps and targets in the Pittsburgh offense in Week 12. Smith-Schuster (hamstring) didn't practice Wednesday. Analysis: Per Jeremy Fowler of ESPN.com, Smith-Schuster's hamstring issue is considered "small," but it's something that the Steelers will monitor, given that head coach Mike Tomlin seems intent on having the rookie wideout put in his share of practice reps as the team prepares for Sunday's game against the Packers. With that in mind, there's reason to think Smith-Schuster may hit the practice field in some capacity Thursday. Steelers head coach Mike Tomlin said Tuesday that Smith-Schuster has a "small" hamstring injury that will limit the wideout's involvement in practice early in the week, Aditi Kinkhabwala of NFL Network reports. Analysis: While Tomlin noted that the lack of practice reps won't be beneficial for the rookie receiver, the expectation remains that Smith-Schuster will suit up Sunday against the Packers. Smith-Schuster has corralled 16 of 25 targets for 337 yards and two touchdowns over the Steelers' last three games, allowing him to cement himself as a starter opposite top wideout Antonio Brown. Smith-Schuster brought in four of eight targets for 47 yards in Thursday's 40-17 win over the Titans. Smith-Schuster brought in five of seven targets for 97 yards and a touchdown in Sunday's 20-17 win over the Colts. 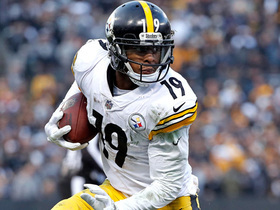 NFL Network's Peter Schrager makes his case for Pittsburgh Steelers wide receiver JuJu Smith-Schuster to lead the league in receiving yards in 2019. 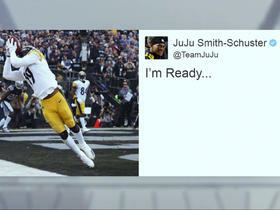 NFL Network's Andrew Siciliano and Aditi Kinkhabwala discuss Pittsburgh Steelers wide receiver JuJu Smith-Schuster's reaction on Twitter to the WR Antonio Brown trade. 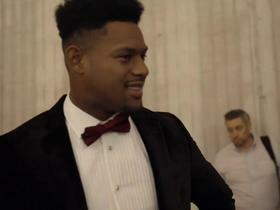 Pittsburgh Steelers wide receiver JuJu Smith-Schuster shows off his fancy footwork in 'The Making of the 100-year Game'. 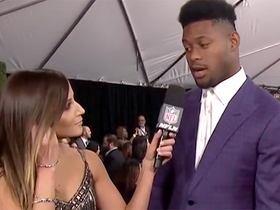 Pittsburgh Steelers wide receiver JuJu Smith-Schuster has fun on the NFL Honors red carpet and interviews NFL Network's Kyle Brandt. 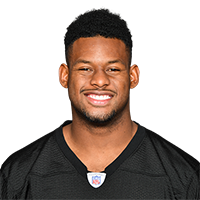 Pittsburgh Steelers wide receiver JuJu Smith-Schuster joins "NFL Total Access" ahead of Super Bowl LIII to talk about the big game, teammates WR Antonio Brown and running back Le'Veon Bell and more. NFL Network's Aditi Kinkhabwala talks with Pittsburgh Steelers wide receiver JuJu Smith-Schuster about his passion to help the elderly in his community and goes with him as he pays a visit to a local nursing home.